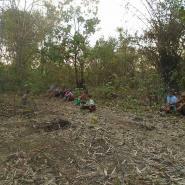 This Situation Update describes events occurring in Kyainseikgyi Township, Dooplaya District during the period between February and May 2017, including development projects, taxation, military activities, the suicide of a Democratic Karen Benevolent Army (DKBA) soldier, land confiscation and transport rules. 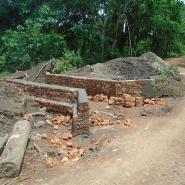 300 brick houses for returning refugees and/or internally displaced people (IDP) in Lay Hpa Htaw/Zi Pin village, Noh T’Kaw Township, Dooplaya District were constructed by Shwe Min Ta Mun Public Co LTD during the period between 2016 and 2017. The land was provided by the Karen National Union (KNU) and funded by the Nippon Foundation, but the local authority has not allowed the returning refugees and IDPs to stay in those houses yet. The Border Guard Force (BGF), who are based in Kyeh Doe area, taxed elephants in A--- village, Noh Taw Plah village tract, Noh T’Kaw Township, Dooplaya District between March and April 2017. The elephant owners refused to pay the tax because the BGF could not provide tax receipts and they did not understand the administrative role of the BGF or the reason for the taxation. Motorcycle taxation in A--- village, Noh Taw Plah village tract, Noh T’Kaw Township, Dooplaya District was collected by the KNU. However, the KNU does not provide a tax disc that is legally valid throughout Karen State. 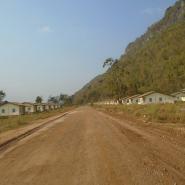 Therefore, the civilians do not feel safe travelling near Kyainseikgyi Town in Karen state. On January 5th 2017, DKBA platoon commander Htee Klee, who is based in Khoh Ther Pler (Three Pagodas) area, came to B--- village, Meh Pra village tract, Noh T’Kaw Township, Dooplaya District. B--- villager, Saw Lwee Heh, signed up to be a soldier in his platoon, believing the position to be well paid. Saw Lwee Heh had been a DKBA soldier for three months without receiving any money, yet he was unable to resign from his job. Saw Lwee Heh later killed himself by drinking pesticide. On May 10th 2017, villagers from Noh Ta Khaw village who were constructing the road between 19 Ter (19 miles) area and Noh Ta Khaw village, Noh T’Kaw township, Dooplaya District built a small dam to block the villagers’ water channel that goes into C--- village, without holding a consultation meeting or making an agreement with the land owners. 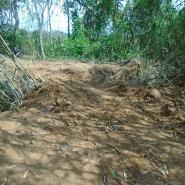 Therefore, the land owners were dissatisfied with the small dam construction. The following Situation Update was received by KHRG in June 2017. It was written by a community member in Dooplaya District who has been trained by KHRG to monitor human rights conditions. It is presented below translated exactly as originally written, save for minor edits for clarity and security. This report was received along with other information from Dooplaya District, including two interviews and 93 photographs. The information from Noh T’Kaw Township, Dooplaya District for this Situation Update was collected [by a KHRG researcher] during the period between February 26th and May 12th 2017. The main themes of the information relate to development projects, taxation, land confiscation and military activities. 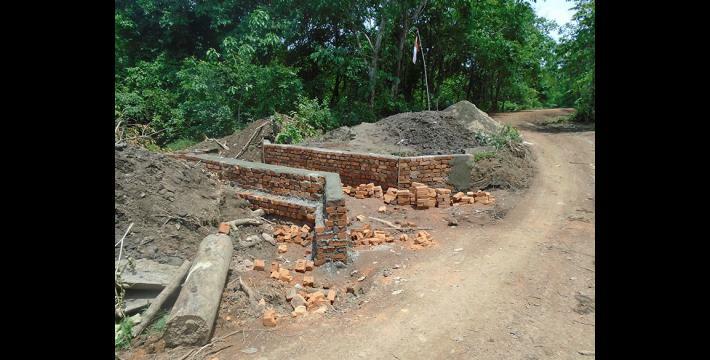 In February, I [KHRG researcher] documented 300 brick houses that had been built for IDPs and returning refugees [on land donated by the KNU] in Lay Hpa Htaw/Zi Pin [Ma Taw Htoo] village, Noh T’Kaw Township, Dooplaya District. Those houses were constructed by Shwe Min Ta Mun Public Co. LTD, during the period between 2016 and 2017, and this project was funded by the Nippon Foundation. 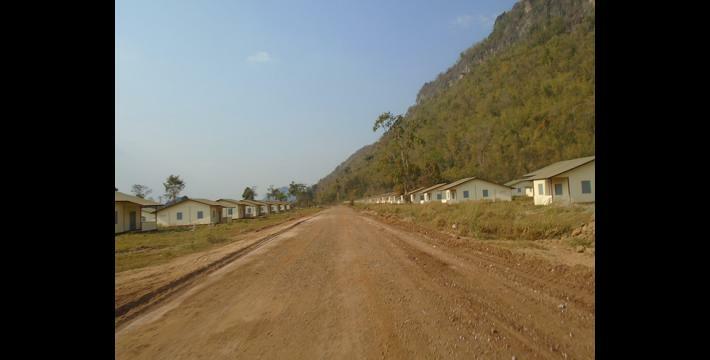 Construction of the houses is finished, but the local authority - the Karen National Union [KNU] - has not allowed people [returning refugees and IDPs] to stay in the houses [yet]. Villagers who live close to this area told me that they do not want to stay in those houses because they will not receive land to farm in order to provide a means of livelihood. They said it will be better if the authority leaders provide farming land for them [as well as housing]. 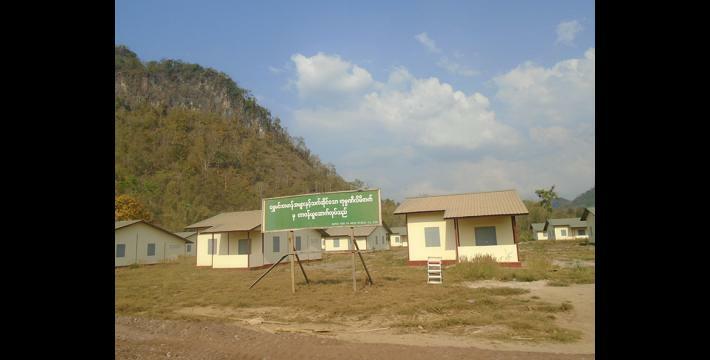 The company which constructed the houses did not have to buy the land to build those houses because the land was provided by the KNU District level administrator. The villagers from C--- village, Noh T’Kaw Township, Dooplaya District were unhappy with this project because the flooding for the dam will negatively affect their land and plantations. Between March 15th and April 2017, the Border Guard Force [BGF] based in Kyeh Doe area implemented an elephant tax in A--- village, Noh Taw Plah village tract, Noh T’Kaw Township, Dooplaya District. They placed an annual tax of 100,000 kyat per elephant [US $ 73.9], but the elephant owners did not want to pay the tax as the BGF could not provide tax receipts tor them and they did not understand the administrative role of the BGF [in their community]. The civilians were confused regarding the taxation [policy] because in the past, there was only the Karen National Union [KNU] who collected the taxation, but there is now one more group, the BGF, which is collecting taxation. 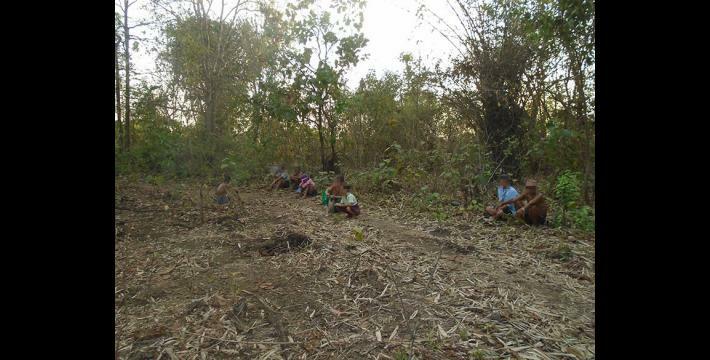 Another taxation issue in A--- village, Noh Taw Plah village tract, Noh T’Kaw Township, Dooplaya District is related to the motorcycle taxation collected by the KNU. They have charged an annual taxation of 2,000 kyat [US $1.5] per motorcycle for around the last two years. Yet this taxation does not provide a license eligible for use in all of Karen State, nor is it recognised by the Burma/Myanmar Government. 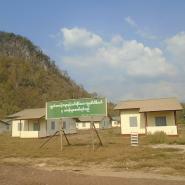 Therefore, the civilians do not feel safe to travel near Kyainseikgyi Town in Karen State. 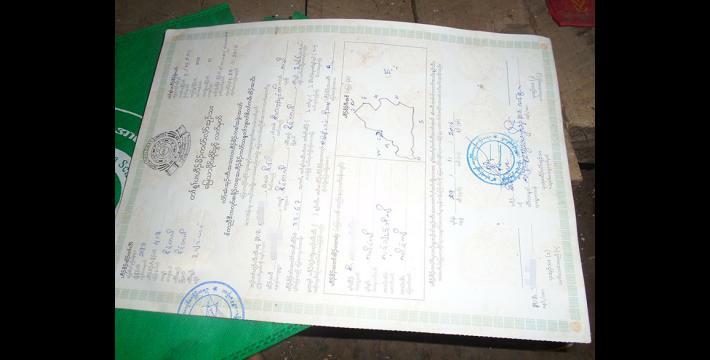 A KNU [worker who collected the taxation] did not inform the civilians where they can and cannot go and instead they told the civilians that “If you go to Kyainseikgyi Town and see the [Burma/Myanmar government traffic] police, run [ride away] quickly from them.” The civilians do not know the date when their motorcycle license will expire, so they want to know the period of validity for KNU’s motorcycle license. On January 5th 2017, Democratic Karen Benevolent Army [DKBA] platoon Commander Htee Klee from the DKBA , led by Officer Bo ‘A1’, Commander of Battalion #9003, based in Khoh Ther Pler [Three Pagodas] area, came to B--- village, Meh Pra village tract, Noh T’Kaw Township, Dooplaya District. The DKBA platoon Commander Htee Klee induced [B--- villager] Saw Lwee Heh to be a soldier and he told to him that he would be paid 100,000 kyat [US $73.9] per month. Saw Lwee Heh signed up and followed him [to the army camp]. Saw Lwee Heh was 39 years old. He was married and he had four children; one daughter and three sons. He had been a [DKBA] soldier for three months, but he had not received any money and then he told his platoon commander Htee Klee to take him back to his village and he would no longer be a soldier. Platoon commander Htee Klee told him “If you resign from [serving as a] soldier, you must pay 1,500,000 kyat [US $1110] [compensation to DKBA].” Saw Lwee Heh was fearful and he killed himself by drinking pesticide. Saw Lwee Heh’s family is poor and after he passed away his wife and children had no job options with which to earn their livelihood. When I asked them [villagers about Saw Lwee Heh’s suicide], they did not feel safe to provide detailed information [because they are afraid of the retribution from armed groups] to me, so I can only report some of the information that I received from them. On February 4th 2017, the BGF broke rules that they themselves implemented by fishing in a protected area in Ya Klo River, A--- village, Noh Taw Pla village tract, Noh T’Kaw Township, Dooplaya District. The BGF had forbidden anyone to fish in the Ya Klo River for a period of three years. Before the BGF forbade fishing in the river, they had held a consultation meeting with villagers from T’Poh Poe Hta area and Noh Ta Khaw area about this process. Therefore, villagers had to obey and could not fish in the river, but they [BGF] were fishing in the protected river [on February 4th 2017] without informing villagers. Villagers were dissatisfied with it [this activity], but they were afraid to tell [complain] about this case [due to concerns over their security]. On March 17th 2017, a case of land confiscation occurred amongst the villagers in Hpa Wah Klo village, Htee Moo Khee village tract, Noh T’Kaw Township, Dooplaya District. Saw Hpa Naw Wee’s uncle tried to confiscate his [Saw Hpa Naw Wee’s] land which is situated nearby to his uncle’s land. They both inherited land from their great-grandparents. 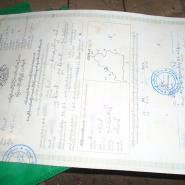 Fortunately, he has a land grant and his land was measured by the KNU government’s land title administration workers. 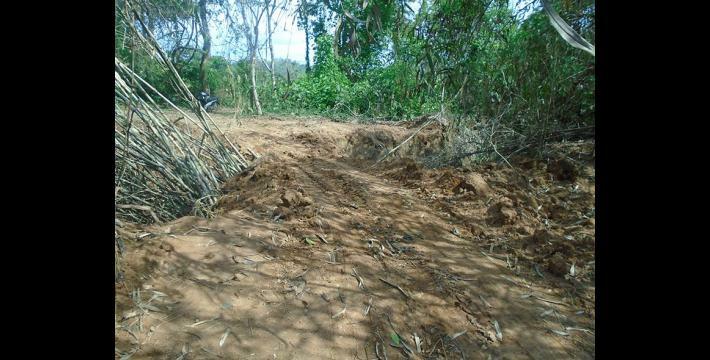 Nevertheless, his uncle dug a water pool on his land without asking permission from him. If even civilians have tried to confiscate each other’s land and [do not respect the rule of law] then the Burma/Myanmar government will [also] continue to confiscate [civilians’] land. There has been a poor implementation of road traffic policies and road traffic rules should be efficiently applied and understood by the people who travel by vehicle in the whole of Dooplaya District. They [some drivers] do not know the traffic rules so they drive in a careless manner and injure people, but they did not look after the injured people. There are many authority groups in Dooplaya District so they should develop rules of transport and declare these rules on paper and then display them besides the road. The above information relating to the past three months were all collected in detail by the researcher and are all true. Regarding the information from this report, [government authorities] should improve administration on such issues as taxation, development projects and military activities in a positive way. Pa Doh is a title meaning ‘governor’ or ‘minister’ within the government. All conversion estimates for the kyat in this report are based on the September 11, 2017 official market rate of 1,353 kyat to US $1.